Along with Ontario Place Cinesphere and Pods, the CN Tower was recognized with the Royal Architectural Institute of Canada (RAIC) and National Trust for Canada’s Priz du XXe siècle thanks to an enduring legacy and innovative design. 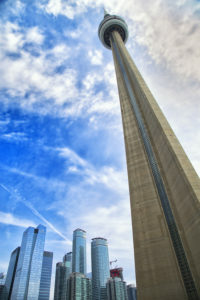 One of Ontario’s most-iconic buildings, the CN Tower, has been recognized with an award from the Royal Architectural Institute of Canada (RAIC) and National Trust for Canada for its long-standing excellence. The tower’s significant contributions to Canada’s architectural history and continuing relevance today have, together, earned it the 2017 Prix du XXe siècle. Designed and built by Webb Zerafa Menkes Housden (WZMH) Architects, John Andrews Architects International, and a team of engineers and contractors, the tower was completed in 1976, and was originally intended to serve as a telecommunications facility. Standing at 553 m (1815 ft), it was recognized as the world’s tallest freestanding structure for more than 30 years, until the construction of Burj Khalifa in 2007. Along with the prize’s other 2017 recipient, Ontario Place Cinesphere and Pods, the tower will be acknowledged at National Trust for Canada’s national conference in Ottawa this fall. The prize itself will be presented at the RAIC/Ontario Association of Architects (OAA) Festival of Architecture May 24 to 27, also in Ottawa. This year’s recipients bring the total number of Canadian winners to 17.